Download subtitles for your video collection. Automatic downloader of subtitles. Just select your local folder with videos, and Subtitle downloader wil download all found subtitles for your videos. Works for movies or TV shows. Subtitles will be downloaded in the same folder with your video file and the same name with SRT extension will be used so any video playback device can recognize the subtitle. Download subtitles for your video collection. Automatic downloader of subtitles. Download subtitles for your video collection. Enables you to automatically download subtitles for your local video collection in your chosen language. 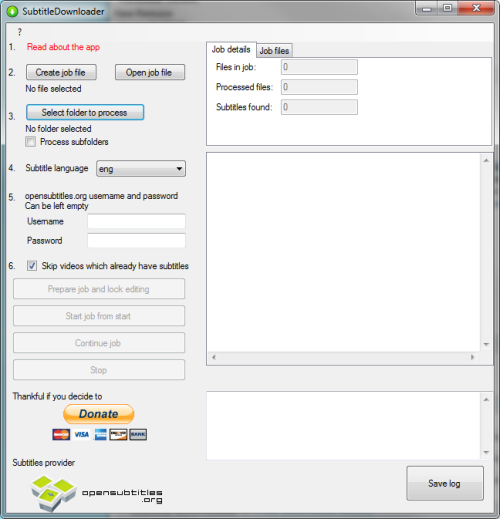 and Subtitle downloader will download all found subtitles for your videos. Works for movies or TV shows. Subtitles will be downloaded in the same folder with your video file and the same name with SRT extension will be used so any video playback device can recognize the subtitle. Qweas is providing links to Subtitle Downloader 1 as a courtesy, and makes no representations regarding Subtitle Downloader or any other applications or any information related thereto. Any questions, complaints or claims regarding this application Subtitle Downloader 1 must be directed to the appropriate software vendor. You may click the publisher link of Subtitle Downloader on the top of this page to get more details about the vendor.